Martha Stewart was stuck in the inevitable traffic of Manhattan’s United Nations week, but no diplomat was going to keep her from her date with a blender in the Bronx at one of New York City’s most glorious kitchens – the New York Botanical Gardens. 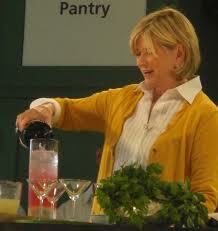 On a recent early autumn evening, the Gardens presented an herb class with Martha Stewart as part of its Edible Garden exhibition. The series features a line-up of celebrity chefs. Martha hosted her own garden this summer at the Gardens with over 50 types of herbs. The event was right on target with what is trendy in mixology right now, as we all knew a Martha Stewart event would be. The days of arcane and precious cocktails have already passed their peak, and now it is the time for simplicity in mixed drinks: going out and picking something special from the late garden and adding it to a spirit.